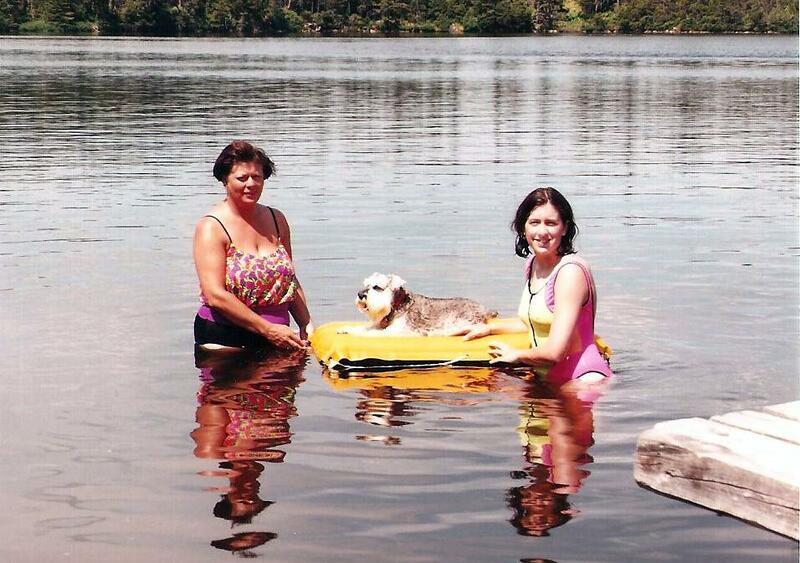 Posted on July 18, 2013 by Virginia Posted in 2013, Bull Pond, Family, NL, Nostalgic, Throwback Thursday	. OK, so maybe the title of this post isn’t completely accurate. Technically I’m not referring to an actual swimming pool. Yes, I did have one of those kiddie pools that had the bendy sides and it was so much fun!!!! But the pool I’m writing about today is actually a pond and for you mainlanders, you can go ahead and call it a lake. Mom and I with my dog Muffin. Not sure of the year, but given our closes, the 90’s more than likely! One of my favourite places on the planet is our summer home at Bull Pond and I’ve written about it before. With this summer already getting fairly hot, I’ve been able to enjoy some nice swims and look forward to lots more. Growing up I didn’t always want to spend my weekend at Bull Pond, but once there I was usually happy. Even on weekends when it rained and rained and rained, I enjoyed playing cards with my mom and Nanny Sturge; I even went fishing on our wharf in the pouring rain a few times with Grandma Radford or out in the boat with Poppy Sturge. These are all memories that I cherish and am grateful to have. I’m really looking forward to helping Miranda to make some great memories up there as well. In fact, she’s already been swimming… well not really, but she was in water while at Bull Pond, so that sort of counts, right? More about that on Monday!